The developer behind a theme park in the resort city of Hoi An in the central Vietnamese province of Quang Nam has pledged to modify the project’s entire design after it came under public criticism for threatening the local landscape and ecosystem. However, the local administration and the UNESCO office in Hanoi have warned that careful steps must be taken to review the revised design so as not to do more harm to Hoi An, home to the namesake ancient town recognized as a World Heritage Site. 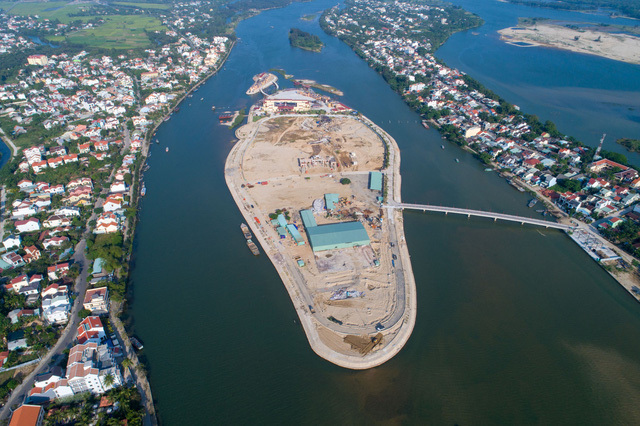 The theme park in question, built on the Gami river islet in Hoi An’s Cam Nam Ward, included a 2,000-seat open-air theater and a 1,000-seat indoor theater among other high-rising buildings in its initial plan. Its developer is Gami Hoi An JSC, which received provincial approval to launch the project on August 2, 2017. Hoi An’s administration, meanwhile, has been a persistent opponent to the project as a whole, claiming that its location would ensue risks of grave damages to the local environment, especially that of the Hoi An Ancient Town. Without proper evaluation and study, the theme park would have an adverse impact on Hoi An’s ecosystem and the river on which it sits, the city’s administration wrote in a letter sent to the Quang Nam administration in May 2016. In reality, locals have reported landslides and subsidence along the river bank since the project broke grounds last year, while the river current has also been changed substantially. In response to public criticism, Hoang Lan Huong, chairwoman of Gami Hoi An JSC, told Tuoi Tre (Youth) newspaper on Friday the company had made a decision to completely redesign the theme park to include more green spaces and reduce the height cap of its buildings. According to the new design, its 1,000-seat indoor theater may be scrapped entirely, while the height of other buildings will be capped at 10.5 meters. The project’s construction density will be reduced from 25 percent to 20 percent to create new spaces for green areas and paddy fields, where local farmers will be allowed to grow crops and harvest. Embankments surrounding the islet on which the theme park sits will be redesigned to allow the river current to flow naturally and prevent erosion. All buildings in the theme park will be rotated in a way that will allow flood water to escape quickly in the event of natural disaster, Huong said. “Those are our commitments and not mere empty talk,” she stressed. Commenting on the developer’s pledge to adjust its design, Hoi An chairman Nguyen Van Dung said the persistent position of the city’s administration on this issue is for the project to include more green spaces and reduce its buildings. “That’s the only way for the project to receive our approval,” Dung said. Pham Thi Thanh Huong, head of the UNESCO office in Hanoi, said the agency had not been consulted about the redesign and that more study must be made to determine whether it is the optimal course of action to be taken. “All options [of redesigning the theme park] must be submitted to relevant authorities for review and should receive full consultations from experts,” Huong said. Hoi An authorities assembled a meeting of its officials on Saturday morning to discuss the latest move by the developer of the Gami theme park.